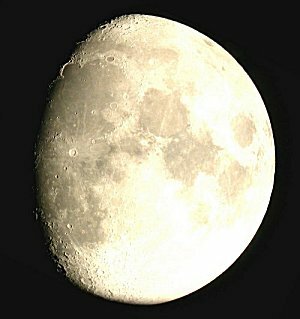 Below is an image of the Moon obtained at 9:22 p.m. May 23, 2010. The image was rotated to roughly align the northern and southern poles to the top and bottom of the image respectively. This allows for easier analysis. How would you find the apparent center of the Moon in this image? The first fact that you must know is that you need to find the real center of the Moon's apparent disk, which includes the part that you cannot see. 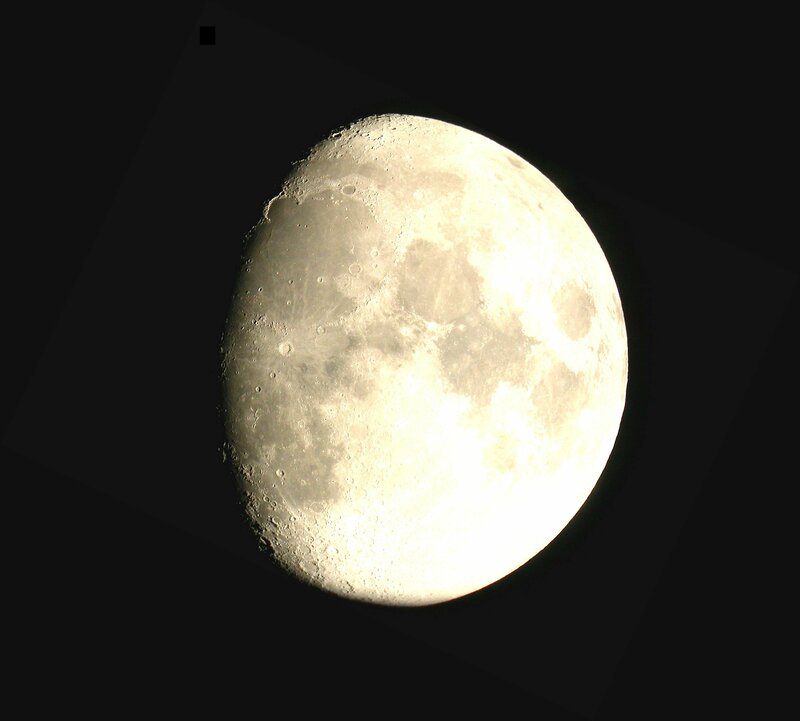 We all know that the Moon is spherical in shape and therefore would appear as a disk through the telescope, however, since the Sun normally lights the Moon at a different angle than we are observing it, the center is not so cut and dry to find. You can find the Moon's center (in pixel values) by choosing three points along the "smooth" limb of the Moon; that is the side that is not the terminator. The terminator is not such a great place to measure from, simply because there is no way to tell where it actually is, thanks to the very uneven terrain of the Moon. Even a tiny feature will cast a very large shadow, thus obscuring the terminator completely in most areas. Click the Moon image above to download a full-resolution image that was used throughout this example. You can use it to verify the calculations. The three points of interest in this example were located at (1737,503) , (1858,1927) , and (2131,1549). Since the point (0,0) is located at the top left-hand corner of the image, the y values will have negative signs placed in front of them to follow the normal right-handed convention. Make absolutely sure that the xc term is correct from the first equation before applying it to the yc equation! To make sure that there are no round-up errors, make sure to keep all of the decimal points for every answer until the final determination.